When you aren’t a part of the local water utilities, it might seem like you’re on your own. Often, this is a benefit, as any service disruptions that can affect a large portion of the region won’t do anything to you. It’s also nice not to have a monthly water bill! But this is a double-edged sword because it can be much harder to fix any major problems that come up. And if your septic system overflows, you can’t afford to wait! Fortunately, you aren’t alone when you choose John’s Plumbing & Pumps, Inc for septic pumping and repairs in Yelm. Our plumbers are experienced in private wells and know the fundamentals so they can figure out what caused the problem in your septic and make sure it doesn’t happen again. What sort of septic system repairs can your plumbing company do? We can replace any broken part! Even if you have an older system, our septic and sewer drain plumbers can find you compatible parts to keep it going strong! One of the main reasons your plumbing fixtures malfunction is due to a clog somewhere in the system. 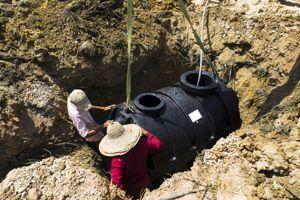 Sometimes, this can emulate other septic problems, but tends to be a lot easier to remove! We have numerous rooters as well as a hydro-jetting system that clears out even the toughest clogs and cleans out your pipes while it’s at it. When possible, we’ll try a video line inspection before excavating your septic to see if we can find out what’s wrong. If we can fix it without that headache, it’s a lot less time and effort for both us and you! At John’s Plumbing and Pumps, we take plumbing seriously. And once the job is done, we don’t just disappear, never to be heard from again. Call us if anything goes wrong later or if our repairs don’t take, and we’ll do whatever we can to make it right. Ask us about our maintenance plans for septic systems and how you can save money with routine inspections and checks. When you work with us, we’ll try to work around your schedule when possible, and we’ll be to our appointments on time. Nobody likes waiting and wondering what’s going on! If for some reason we have to change your time due to a plumbing emergency elsewhere, we’ll let you know as soon as possible. 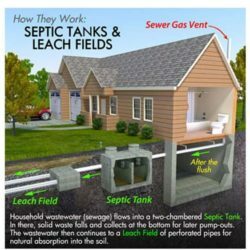 So choose us to work on your septic system in Yelm and see it done right!